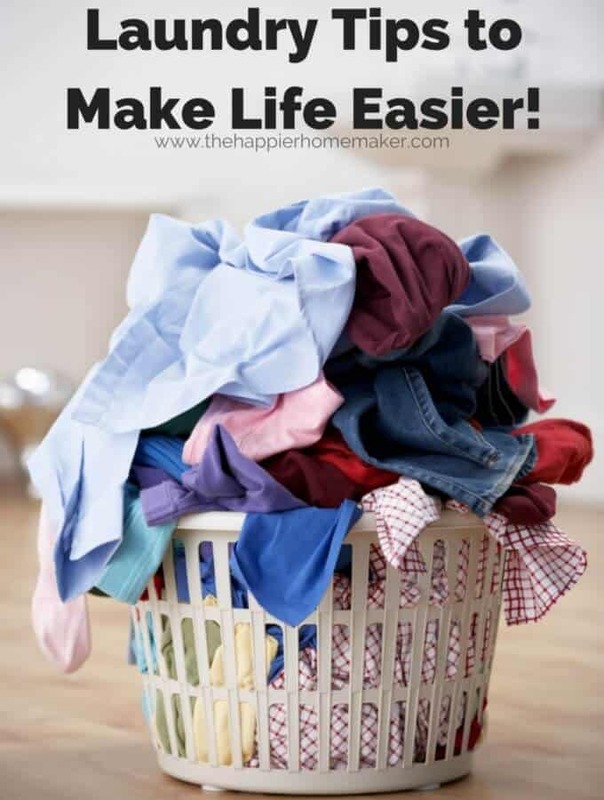 Laundry Tips to Make Life Easier! We are a family of five and I’m not joking when I say that we create mountains of laundry! My husband is a soldier so he daily wears a uniform, exercise clothes and then casual clothes at home. My three crazy sons practically draw dirt to them magnetically and my youngest is young enough that we still get the occasional accident. Add my gym clothes 4-5 days a week and weekly linens and you can see that I could easily get buried in laundry without a system. 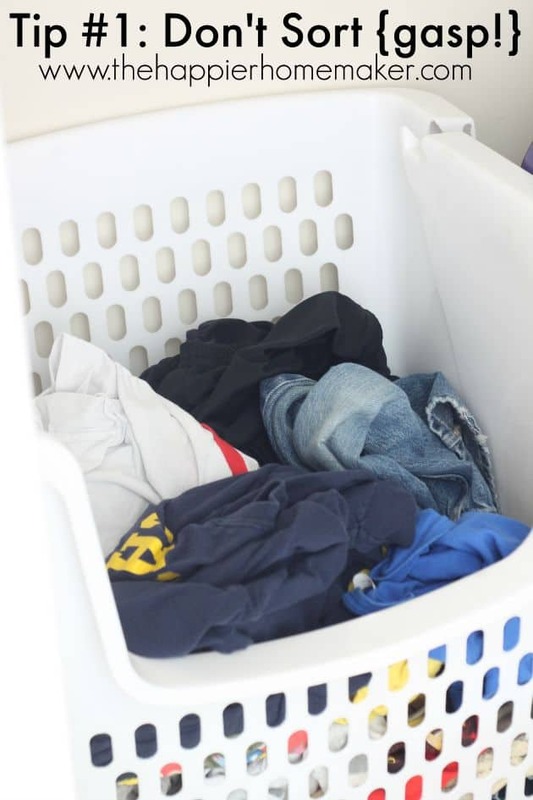 Over the years I’ve figured out exactly how to make laundry easier for our family and I’m hoping some of my laundry tips will help reduce your “load” (pun intended!) too! I don’t separate out my whites and colors, I know-blasphemy! Unless it is new clothing that I suspect will bleed and I’m washing it the first time, I throw everything in together. We’re tough on clothes and if they can’t handle being in the wash together then they won’t last long in this house anyways! We keep on large hamper in our laundry room and my boys put their clothes directly in the hamper (this is great for us because our laundry room is on the same level as our bedrooms, it obviously won’t work as easily if yours are on different levels.) My husband also empties his work bag directly into this hamper when he gets home as well. I keep another hamper and a delicate bag in my bedroom so my delicates go directly into the delicate bag. Be sure to fold the laundry as soon as it’s dry to prevent wrinkling. My kids are 4, 7 and 8 and they help me with this part. They can all fold the towels and sort socks (they started helping with this by age 2!) When I’m folding I fold in piles according to person-so one stack for me, one for my husband, one for each kid. 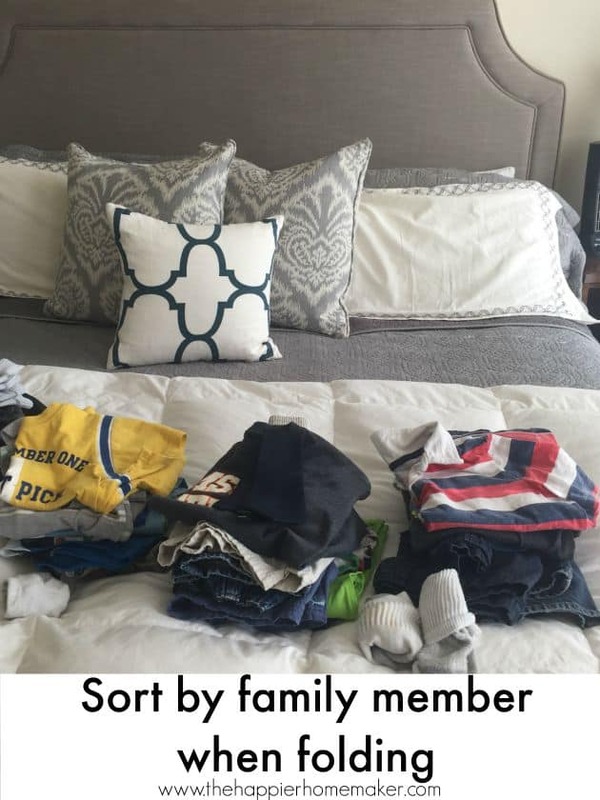 Then I call my boys to put their own clothes away (I don’t hang the majority of their clothes because they can’t reach the hangars and I want them as self-sufficient as possible!) My oldest can take his stack and put it away easily, for my seven year old I sort his stack into multiple stacks by drawers, so he will grab all his jammies and put them away, then come back for shirts, etc. This keeps him from shoving everything into one drawer which he has a tendency to do! I do the same for my four year old with a bit more supervision and guidance as he’s still learning. So what does laundry look like at your house? Do you do a load a day, are you drowning in piles of unfolded laundry? Excellent tips listed here. I am always on the lookout for time/money saving tips (especially when it comes to weekly tasks). I think I hit the motherload with this one. I will have to try some of these out and report back on how they worked out. I see promise. Thanks a ton for sharing! Great tips! Thanks! Do you limit how many outfits each child has? How many pajamas etc? We are a family of 6 and I get so overwhelmed with the amount of housework. We live in a townhouse and I feel we have too much for our space. We’re in a townhouse too Amber-family of 5. Honestly my boys are growing so fast that I limit their outfits out of budget reasons-I have three boys so my oldest has the fewest clothes, my second oldest is trailing right behind him in size so they each have about 4 pairs of pants and share about 10-12 basic shirts. My youngest however has a HUGE amount of clothes from hand-me-downs but he usually wears the same few outfits over and over. I have to wash their clothes about 3 times a week to keep them supplied with clean things to wear but for me right now that’s better than spending the $ to buy more clothes or the space to store them! For adult clothing, I take it out of the dryer ASAP. All tops are stacked flat (unfolded); jeans are folded immediately and placed in laundry basket. Everything else is tossed in basket and carried to bedroom for folding. That stack of tops? I quickly count how many, then grab the appropriate number of hangers…I slip hanger into top and flip it forward, slip hanger into next top and flip, and so on. Then I grab all the hangers and carry them to the closet to hang. Then I add hangers to the folded jeans and put them in the closet. Next, I fold the towels and put them away. That leaves the underwear and socks to sort, match, and fold. It all goes very quickly. Bras get laundered in a ‘delicates’ bag in the ‘whites’ load, then hung and air-dried. Bed linens are washed separately. This method works well for me, but then, it’s just me. My daughter is buried in laundry! She has two kids, 6 and 8, and a house too small for their family. Plus, she works full time in her own dog grooming business. She could use your laundry tips!